SHABBA & REYNALDOVICE DID THIS 24 HOURS AFTER...+ NU LOOK. 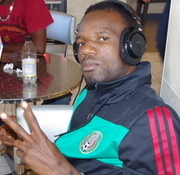 DJAKOUT. TI JOE ZENNY. HARMONIK. TABOU NEWS + MORE! SHABBA and REYNALDOVICE did this less than 24 hours after....+ TI JOE ZENNY is keeping this secret to...+ NU LOOK/DJAKOUT Miami bal partners...DO RIGHT BY A2Z...NOW! + Harmonik mystery + MORE! *NU LOOK/DJAKOUT MIAMI BAL PARTNERS....DO THE RIGHT THING BY A2Z! *HARMONIK MYSTERY ANSWERED BY GENERAL MANAGER RODNEY NOEL! *TABOU COMBO SEDUIT LE PUBLIC GABONAIS! *J PERRY DEKOLE OFFICIAL MUSIC VIDEO FEATURING IZOLAN & SHABBA!